Trump administration officials are set to tout coal, natural gas and nuclear power at an event during the United Nations' annual conference currently underway in the old coal-mining Polish town of Katowice. 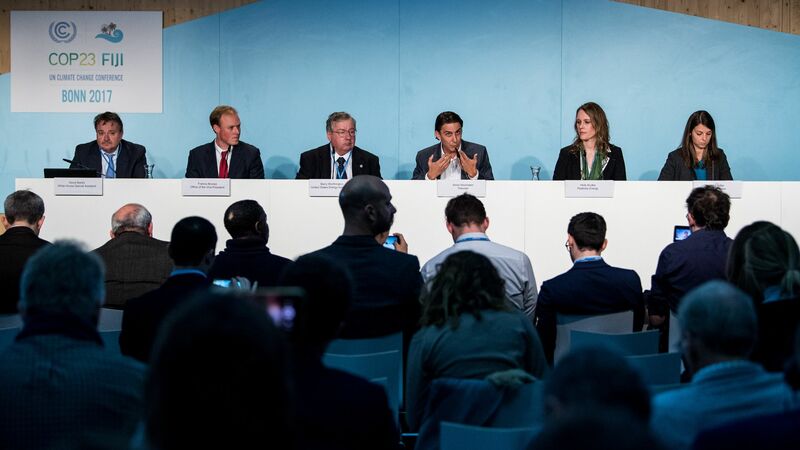 Driving the news: The side event, which the administration is holding for the second year in a row, comes as global leaders attempt to make progress on the 2015 Paris Agreement amid dire reports on how difficult that will be. Wells Griffith, Trump’s adviser on global energy and climate issues. Steve Winberg, assistant secretary for fossil energy at the Energy Department. Rich Powell, executive director of the ClearPath Foundation, a nonprofit working on cleaner energy technologies from a conservative perspective. Asfaha Tesfai, director of commercial development for Sempra LNG [liquefied natural gas] & Midstream. Cheniere Energy, another company exporting natural gas, declined to participate in the event, according to a person familiar with the event. An Energy Department spokeswoman confirmed Winberg’s participation. Powell confirmed his participation and said he would be focusing on advanced nuclear power technologies. A spokesman for Sempra confirmed Tesfai's participation. What’s next: I'll be in Katowice beginning Dec. 9. Negotiators are looking to make progress on the technical aspects of the 2015 deal, which goes into effect in 2020. Editor's note: This story has been updated to add a representative from Sempra as a panelist at the event.